The 2014 NFL schedule opens up with the defending Super Bowl champion Seattle Seahawks hosting Aaron Rodgers and the Green Bay Packers on Thursday, September 4th. There are a total of 255 games on the 2014 NFL schedule. You can follow all the action with the complete 2014 NFL schedule from PrintableBrackets.net. 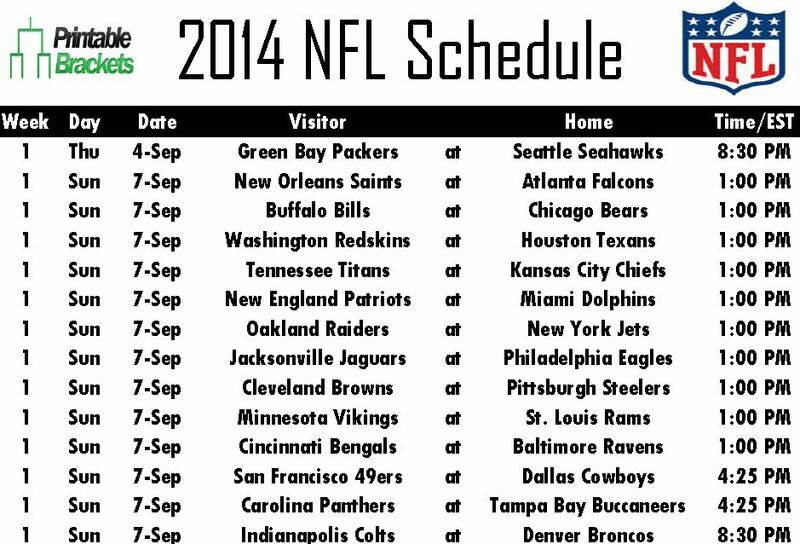 The 2014 NFL schedule is instantly downloadable, printable and available free of charge right here on this page. The league instituted some changes for the 2014 NFL schedule. The league can now “flex” or move a game into and out of the “Sunday Night Football” slot beginning as early as Week 5. Previously, the “flex scheduling” policy didn’t take effect until Week 11. In addition, the NFL can now “cross flex” games between broadcast networks. Previously, a single network had exclusive broadcasting rights to a game featuring two teams from the same conference. Now, the league can move the game to the other network to balance the broadcast schedule. The opening contest on the 2014 NFL schedule features a matchup of playoff teams from a season ago. Seattle is coming off of its first Super Bowl victory in franchise history. After dispatching of the New Orleans Saints and the San Francisco 49ers in the NFC playoffs, the Seahawks demolished Peyton Manning and the Denver Broncos, 43-8, in Super Bowl XLVII. The Packers earned a spot in the postseason after winning the NFC North, but were ousted by the 49ers in the Wild Card round. There are several other notable games in Week One on the 2014 NFL schedule. Drew Brees and the Saints will renew their rivalry with the Atlanta Falcons. Fellow longtime rivals will meet in Dallas when Tony Romo and the Cowboys take on the San Francisco 49ers. Meanwhile, Peyton will face his former team when the Broncos host Andrew Luck and the Indianapolis Colts on “Sunday Night Football”. Week One on the 2014 NFL schedule also features a pair of Monday night games. First, Eli Manning and the New York Giants will travel to Detroit to do battle with Calvin Johnson and the Lions. Week One wraps up with the Arizona Cardinals hosting Philip Rivers and the San Diego Chargers.